"Conflict, violence, and difficult choices that bear risky consequences and deliver great suspense. Highly recommended!" The Columbia Review. 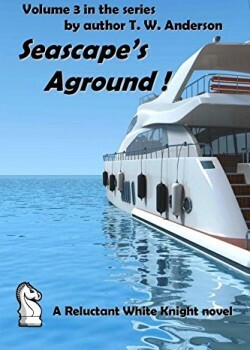 “Seascape’s Aground!” is the third installment in “A Reluctant White Knight” – an action adventure series of novels from author T.W. Anderson. Building up on the first two novels, “Seascape Aground” starts off with the bang and only gets better. The story opens with our hero, Tom Rowter, about to board a helicopter for another mission, but held back for a last goodbye kiss from his loving wife, Sunny. For those who trust the feminine sixth sense, this scene provides the reader with the required premonition: Something bad is going to happen. And it does. As the story gets on the way, Tom answers a call to duty, and things get rapidly more complicated. There are good guys and bad guys (and good guys who turn out to be bad), conflict and violence, and difficult choices that bear risky consequences. The action scenes are tense and believable, and so are the tender moments. Especially for readers who have experienced firsthand the pleasures and challenges of second chances, relationship wise, and of romance later in life, this volume provides a bonus in sharing a more intimate and authentic window into the trials and tribulations that test — and strengthen — the relationship between Tom and Sunny. In summary, this third novel in the series provide an enjoyable combination of action, conflict, and suspense, spiced up with romance and family tensions, government corruption and drug cartels, plus a host of exotic locations that add excitement and interest. We look forward to the next installment in “A Reluctant White Knight” – a promising series from author T.W. Anderson.